As Migdalia jumped to her feet, I could see that her face reflected her concern. She wondered out loud if we were making the right decision as we continued to debate our options. The topic of our debate was what we should do with the money that we had raised at our school, Democracy Prep Endurance Middle? 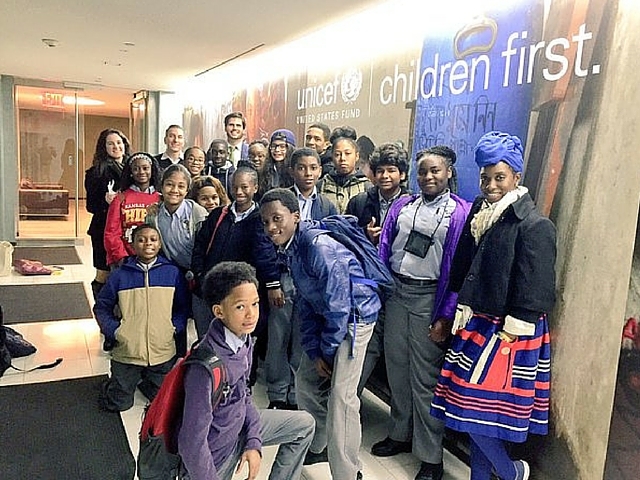 We learned of many donating options during our visit to the UNICEF headquarters in New York City. As members of the Scholar Senate, we wanted to make a good choice. Should we donate $50 to pay for 900 nutrition packs or 30 vaccines? In other words, would it be more beneficial to prevent 30 people from getting a virus with a vaccine, or help more than 100 people get the nutrients they need to stop malnutrition and hopefully avoid getting a virus. “I believe it’s better to work on the effect and then fix the cause,” said Prince A. “If you fix the cause, then there will be no effect” Gifty A. added. Two different and brilliant arguments. 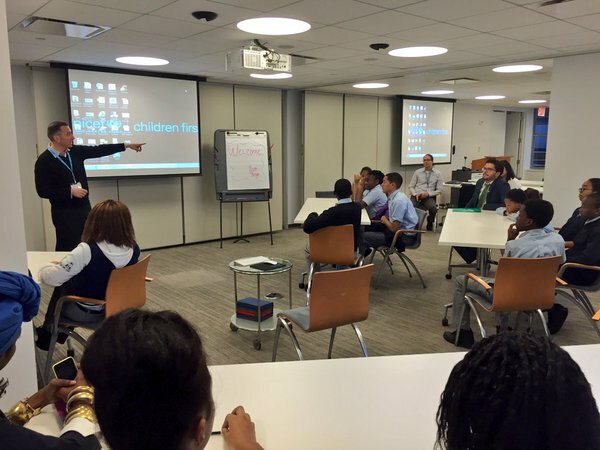 The debate all started when UNICEF staff members challenged us to a simulation game. Each group was given an iPad. They then pretended to be helpers for Barika Village, a fictional village created by UNICEF to represent many of the problems in the West Sahel region of Africa. Villagers are poor and malnourished, and droughts flood this jubilant village. We were given the opportunity to find solutions to help this village. Each group had $45,000 to spend to help the village and its people. . My group spent $7,800 on education and nutrition for 300 children over 4 months. We then spent $5,000 for a well and water pumps that would last ten years, $2,250 for five months of healthcare and nutrition for 150 children, $9,720 to support 450 children with Family Water kits that would last for 8 weeks, and $25,650 for 6 weeks of therapeutic food and milk that could support 225 children. At the end of the activity, we agreed that the biggest challenge was deciding which material was worth us spending more on. The simulation showed us how we can impact real people. It was also a part of the larger lesson that UNICEF wanted us to learn about Africa being more than a single story of despair and hopelessness. Often people who want to help places in Africa think that the whole continent is economically challenged and savaged when that is absolutely not true. They told us to think about it the way we think about the U.S. We have our problems: gun violence, gang activity, police brutality, racism, gender inequality, etc. The problems can seem endless like any other place. But we also have Christmas, Halloween, and the 4th of July, and that is the same for Africa. Beside the negatives, Barika Village had fun, games, and celebrations to keep up the happiness. They had ceremonies, dancing, drumming, festivals, storytelling traditions, and more. As a person of African descent, this lesson was really important to me. Now that we knew more about the Barika Village, and were able to practice making such impactful decisions, we were able to vote to donate the money to buy 900 nutrition packets. The more people we can help, the better. “I think more children should get involved. It was emotional, exciting, and enlightening; it made me want to do something,” said Migdalia O..
We’re just a bunch of middle schoolers, but thanks to UNICEF, we were able to impact the world in a really positive way. Fatou K. is a eighth-grade scholar at Democracy Prep Endurance Middle where she is a member of the Scholar Senate. Senior Scholars Attend College Signing Day Hosted By FLOTUS!